The House on Thursday voted to repeal the estate tax on multimillion-dollar estates and farms, but don’t assume this is a harbinger of major tax reform this year. House Speaker John Boehner and other Republicans hailed the vote as a boon to family farmers, ranchers and small business owners who want to pass along the fruits of their hard work to their children and families. But Democrats and the Whitehouse dismissed the vote as a needless giveaway to several thousand of the wealthiest families, and the bill faces certain defeat in the Senate or a presidential veto. While nearly 60 percent of all Americans favor major tax reform, according to a recent Pew Research Center survey, odds are against Congress approving major tax reform this year, as the 2016 presidential campaign begins to heat up and partisan positions begin to harden. The three announced Republican candidates for president already are spelling out their stands on the issue, according to Roll Call: Sen. Ted Cruz of Texas favors outright abolishing the IRS and replacing all current taxes with a flat tax. Sen. Marco Rubio of Florida favors eliminating most taxes on capital gains, dividends and estates. And Sen. Rand Paul of Kentucky favors a temporary reduction in the repatriation tax on overseas earnings as a way of generating revenue to underwrite federal highway and transportation projects. Many others, including Sen. Orrin Hatch (R-UT), chair of the Senate Finance Committee, and Rep. Paul Ryan (R-WI), chair of the House Ways and Means Committee, have very different ideas of what a comprehensive tax overhaul ought to look like. The last time Congress agreed on major tax legislation was in 1986. Many say there is only feint hope Congress can reach a consensus this year to streamline and simplify the tax code and weed out costly tax breaks and loopholes. Clearly, one of the biggest challenges will be to overcome intense lobbying efforts by businesses, institutions and other special interest groups to rewrite or eliminate scores of tax breaks embedded in the federal tax code that are worth more than $1.3 trillion, according to the Joint Committee on Taxation. The roughly 200 so-called tax expenditures are a huge drain on the U.S. treasury because they represent potential tax revenues that will never be collected. 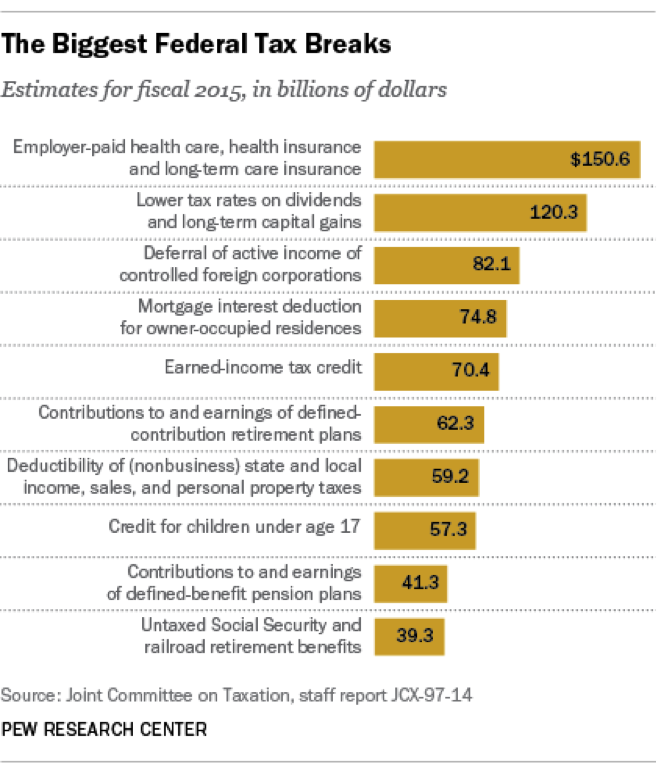 By far the biggest individual break is for employer-paid health care, health insurance and long-term care insurance, none of which is counted as taxable income. That provision alone cost the government $143 billion in the last fiscal year, and is estimated to cost $150.6 billion this year. The provisions taxing dividends and capital gains at lower rates than ordinary income will deny the Treasury an estimated $120.3 billion in the current fiscal year. The controversial mortgage-interest deduction will cost nearly $75 billion this fiscal year, while the accompanying deduction for local property-tax payments will cost another $34 billion. Most of these loopholes and tax breaks benefit individual taxpayers who paid $4.8 trillion in taxes in 2014—more than what they spent on food, clothing and shelter. Adding to their tax burden could have serious consequences. Since consumer purchasing power is the engine of the U.S. economy, reducing their discretionary income could tilt the balance of against too heavy a tax load. Pew analysts and others caution that it’s risky to view these costly tax breaks or “tax expenditures” in a vacuum, and that doing away some of these special-purpose breaks could have unanticipated consequences while not necessarily sweetening the Treasury’s revenue pot. For instance, repealing the tax exemption of employer-provided health insurance could trigger a stampede of Americans seeking replacement insurance to the exchanges created by the Affordable Care Act, with corresponding increases in state and government operating costs and subsidies. Others, including economists at the conservative Mercatus Center at George Mason University, have argued that eliminating the tax exemption would be a good thing. That’s because it would allow employers to increase employee pay by a comparable amount – $12,000 or more annually – and enable employees to shop for health insurance better tailored to their needs.